I have to start this week by telling you how amazed I am at how well Metalogix SharePoint Migration tool is performing on my current SharePoint project. Regularly readers will know that I have often been doubtful about tools that claim to migrate from SharePoint 2007 to 2010. Well, I was wrong. The latest Metalogix version does really work once you have mastered all the many little switches you can turn on or off and finally managed to connect to both environments using the Metalogix Web Services connector. So it is possible to painlessly transform your SharePoint 2007 system into the new sexier 2010 with it’s jazzy ribbon and overall more powerful features. Without getting some very strange results. Unfortunately for the Villa migrating a whole football team is not so easy. Yes, you might have noticed with only one point from three games the Villa are not exactly setting the world alight under new manager Paul Lambert. My phone keeps receiving so called funny jokes at my beloved Villa’s expense; like ‘Villa has just signed Lenny Henry. It is the only way they will be staying in a Premier next season’. But I am not worried because I can see the team is being transformed with nine new players being bedded in and an exciting passing style now being incorporated. It takes time and unlike Metalogix’s Migration software cannot happen overnight. So why am I suddenly such a great fan of this Migration software? I have found through trial, error and the fast response of their support centre that it is possible to get a near perfect upgraded site. All you do is copy the original site and then paste it where you want on the new 2010 (you can include all subsites in one go) then you sit back and watch as it churns along. Sadly, it doesn’t estimate how much time it is going to take so it is a bit of guess work but normally time to go and make a cup of coffee. At the end you will find some little frustrations at first glance, like the Alerts haven’t come over or the navigation is wrong. But these can be very quickly remedied by copying site again and then choosing ‘Paste Special’. This lets you just copy and paste the Alerts or the Navigation over what you have already copied. Another option that is great is the incremental copy option. So you can migrate all your sites one night and then another night migrate any changes that might have been made to your original sites since migration because somebody didn’t read the email that went out. The software even changes any links to the old system to the new one. Perhaps I have made everything sound just a touch too rosy though because even with Metalogix there are a few cons. Firstly, it isn’t a cheap package although we at Office Talk will always try to be the cheapest resellers of it. But it will save you many many man days and a lot of frustrations. That is when you finally get all the settings correctly set and this isn’t easy. The cost is also calculated on how much data you have to migrate. Two important starting points here is to make sure first that that machine you install on in the 2007 is able to browse to the 2010 SharePoint and visa versa. You may well have to tweak the Hosts files to get it to work. Secondly, I recommend installing the management console for Metalogix on the 2010 App server. Then install the Metalogix Web Services Agent on ALL of the 2010 Web Front End Servers. Then also install the Metalogix Web Services Agent on ALL of the 2007 Web Front End Servers and the 2007 App server. When you connect the Web Apps on the Management Console I recommend forcing it to use Metalogix Web Services not to leave it to automatically choose. Oh, one last point is if possible try to have an account that is a Farm Admin in both environments to use to connect with as this will make your job a lot easier. But once you have got all of the above working it really is plain sailing. So if you want to find out more about this software or even try it out just click here. If only Paul Lambert could try his signings out first. But in Paul Lambert we trust and we just hope he can be the success that he was at Norwich City. If you do try Metalogix out, or have used it before, please leave me a comment. Also comments on the Villa’s new signings would be good, but please no more relegation jokes, it is only September. I shall leave you with the old favourite. What’s the difference between a triangle and Aston Villa? Answer : A triangle has three points. Apologies for the lack of posts lately but the SharePoint world has suddenly gone crazy. It seems that every company is moving to or wanting to find out more about Microsoft SharePoint. So the SharePoint consultants at Office Talk have been extra busy. Maybe it is a sign that the recession is finally coming to an end or maybe more likely that companies are seeing SharePoint as a way to save their business money in the long term. Any costs that can be reduced are always good. Which brings me onto the Olympic Games, but lets forget all the money and the issues with security and just enjoy the amazing spectacle that is going to hit Great Britain for the next two weeks. I really am excited and can still clearly remember how excited I was seven years ago as I ate my lunch in a car lay-by waiting for the announcement of who would host the 2012 games. It seems a long time ago now and certainly a lot has happened in my life since that day in 2005. I wasn't even a SharePoint Consultant back then. In fact I was in the middle of leading a SharePoint 2003 project as an IT Manager. Now we have seen version 2007 come and go and then the all ribbony SharePoint 2010 version being such a massive success. Now we are about to see the beta version of 2013 launched. SharePoint has just gone from strength to strength and really is Microsoft's Gold medal winner. But if SharePoint was in the Olympics (I mean entering as I know it has a key roll to play in the organising and managing of the Olympics) what event would it enter? I think it would be a classy runner, a long javelin thrower, a very good pole vaulter and a successful long jumper (as in jumping a long way not a jumper that has been stretched in the washing machine. Although my jumpers are more likely to shrink in our washing machine). But perhaps in each of these events SharePoint would make the podium but not take the gold. Because although SharePoint is an excellent Document Management System, superb Electronic Forms System, terrific Reporting System and wonderful Intranet it probably isn't the best at any of these. You could, with enough pennies, go out and buy a better system for each of these individual operations. But where SharePoint does take the gold is it does all of these operations really well. So if it was in the Olympics it would romp away to Olympic gold and smash all World Records in the Decathlon. It would be like a supercharged Daley Thompson completely unbeatable. So if I am saying that SharePoint is 'A jack of all trades, master of none', why is it such a vital business tool? The reason I believe is because of it's simple to use common platform. It uses the standard familiar Microsoft Office applications and all parts, be it Lists, Libraries, Picture Libraries, all work the same way. Employees don't need to attend several different training courses because every part works the same way. Once you have mastered creating a view and setting up a custom list you are on your way to becoming a SharePoint expert. With only having one system your IT support and maintenance costs will quickly shrink. At Office Talk we encourage all our SharePoint clients to offer training to all their End Users as part of rolling out SharePoint. Just a two hour course and get them quickly using some of the more advanced SharePoint features, but as we all know we quickly forget what we have learnt. Olympic athletes train for hours each day. I don't expect you would find Tom Daley getting on to the Olympic diving-board having not trained for three months. So Office Talk are currently promoting a set of short SharePoint 'How to Do' videos that can be there for a permanent reference for your SharePoint End Users whenever they are trying to remember how exactly they managed to do something they tried in the Training Course. Obviously I wouldn't recommend this for Tom Daley on his diving-board as I am not sure performing a tucked reverse two-and-a-half somersault would be achievable whilst carrying a laptop. But for SharePoint short videos (CBT Clips) are ideal. Now I will close this week by being totally bias and wishing the very best luck to everyone representing Great Britain during the Olympics and Paralympics (even if you are a so called Plastic Britons). Let's keep hearing the Queen's favourite song and see plenty of gold medals dangling on Stella McCartney vests. How to order a meal or use SharePoint? Before I suggest how you can make life easier for your SharePoint End Users I would like to share with you an event that happened to my family last Friday night which made me decide on today's topic. You see, in the UK at the moment (well when I started writing this) we are having a heatwave. This means we have left our coats at home for a week, had to mow the lawn several times and my baldy head is very red. So on Friday night like many other families we decided to head for a nice country pub for our tea. After finding no room at several inns we finally settled on a pub where the waiting time for a table was only half an hour. So we got some drinks and waited. After only about 20 minutes the lady at the desk shouted over 'Table for Dale' and then showed us to our table and handed us each a menu. All seemed to be going well and we each chose what we wanted from the impressive looking menu. Then we waited. Ten minutes passed and still nobody came to take our order. Twenty minutes and my stomach was rumbling, but still waiters and waitresses walked straight on by. Half an hour and I decided to change what I was going to order, but still nobody came to the table. After forty minutes I began to look around and wonder why other people, who had come after us, were now being served their food. It was then a worrying thought entered my head. I stopped a passing waiter carrying a plate with a large fish on and asked, 'Excuse me, is it table service here?'. The answer, as I had feared, was a, 'no, you have to order at the bar, mate' and the waiter left shaking his head. So we had waited hungrily for over 40 minutes because nobody had told us that orders had to be placed at the bar. I complained, a little, to the lady who had seated us and she did apologise for not saying, but pointed to some really small text at the bottom of the middle page of the menu (hidden behind a custard stain) that did say 'Order at Bar'. So why did this get me thinking about SharePoint? It was because I was thinking about the poor End User who sits there in front of these great looking sites and while they can read lots of information they don't really know what they are supposed to do. They know they can upload documents, but do not quite know how to do this. They don't know that you have to open a document library first. Or they want to edit a document but they don't know they need to check it out first. There might be a picture on the site that they want to change or they might have heard about setting Alerts but don't know how to set one up. Ideally End Users will have been given some initial SharePoint training but they will soon forget. I have to admit that I had been to that pub last year, but had forgotten that you had to order at the bar. So how can we help our SharePoint End Users to know the basics of what to do? Without them sitting around for over 40 minutes waiting for somebody to tell them. The best way is to put information on the site with instructions. If you have used SharePoint Designer you will know you can easily add Hover-Over bubbles or Help Straplines to your sites. Office Talk have found that many customers try to get round this problem by creating short video clips of how to do basic SharePoint functions. Tools like the popular Contasia Screen Capture are great and fun to use, but can take weeks of work and never quite reach the professional standard you were looking for. So the cost of producing these internally can be quite expensive. The advantages of doing them yourself is that any corporate branding you might have used or anything unique to your site comes across, but is it really worth it. One of the leading SharePoint products that we at Office Talk resell is 'SharePoint CBT Clips'. SharePoint CBT Clips are available for either SharePoint 2010 or 2007 version and are a super set of around 75 little video clips (about 3 minutes each) that show the End User exactly what to click on to do all the basic SharePoint jobs. Some of the classic ones like 'Working with List Data', 'Sending a Link to a Document', 'Recovering Deleted Items' and 'Connecting to Outlook' are all there. The great thing is the files are small and can easily be stored in SharePoint allowing the End User to access them directly through their SharePoint Site. Now, I have worked in an IT Helpdesk and I know that giving the End User direct access to the information doesn't mean some of them won't still call the IT Helpdesk straight away but at least if you have the SharePoint CBT Clips the Helpdesk staff can just quickly send back a link to the exact video. It really is a money saver. Oh dear this post is turning into an advert, but I am really impressed with these short clips and Office Talk are currently selling a Corporate Licence (which allows you to put all 75 on a SharePoint Server) for only £1350. It really is a way to dramatically reduce your training costs. To find out more about, or purchase a copy of, 'SharePoint CBT Clips' please drop an email to our Marketing Manager Frank Faulds . In next week's post I will be bringing you a free SharePoint Template to keep track of all the groups in Euro 2012 and let you back Roy's Boys in Poland and the Ukraine. This year let's go one better than 1996 and reach the final. This week I am going to be lazy as the sun is out and republish a blog from September 2010 because yet again the Villa are desperately seeking a manager. So I am returning to my post that compared choosing a Villa manager with choosing a SharePoint Consultan. Main difference being though you don't have to pay SharePoint Consultants millions if you ever have to sack them. This year though Liverpool, the Baggies and possibly Chelsea are also looking for a new boss. So here is the revised blog advice on how to pick a new football manager or a SharePoint Consultant. Ok I am slightly biased as I am a SharePoint Consultant at SharePoint Specialists Office Talk, but this still doesn’t stop me making myself available to Villa owner, Randy Learner, if he wants to give me a call. Hopefully Randy is not aware of my performance on Championship Manager last week when I was sack as Villa boss after just seven games. My odds of getting the Villa job are quite low though with younger names like; Ole Gunar Solskjaer, Paul Lambert, Roberto Martinez and Roberto (I won Champions League) Di Matteo in the hunt. Perhaps I should stick to being a SharePoint Consultant. 1. Do they have Knowledge in your business, or organisation area? In the same way I believe that Villa should look for a manager who has experience in the Premier League it is important that your SharePoint Consultant has worked on a similar project to yours. 2. Do they speak your language? If they talk in too ‘techie’ speak will they really be able to communicate successfully with your Project Team. Maradona (who was in the betting last time) might have been a brilliant footballer but he doesn’t speak English. That might be have been ok for the England national team but not the great Aston Villa. 3. Do they have SharePoint Connections? Are they well known in the SharePoint community and are they able to help expand your SharePoint with knowledge of business enhancing add-ons. In football the new manager needs to be able to attract new signings and it is useful to have contacts. 4. Are they Qualified? What Microsoft and SharePoint qualifications does the potential SharePoint Consultant hold? Managers in football now need the appropriate coaching badges to be able to manage. Oh dear, that goes against my application for Villa job. Perhaps my MCSE could stand for Managing Coaching Soccer Excellence. 5. Are they Available? How soon can they start working on your SharePoint. You don’t want to think that nobody else wants them but also you don’t want to have to wait seven months before they are available. With football some top managers who aren’t available can become available if you offer enough money as compensation. Please nobody say Steve Bruce. 6. Are they Affordable? It is important that the SharePoint Consultant is within your budget. You will be surprised at the differences in rates for Consultants in the UK. There is the argument you get what you pay for so if it seems too cheap ask yourself why. Also are they clearly stating how many days are involved in the SharePoint Project? Football teams (apart from Man City) are also feeling the financial pinch at the moment. Lack of money to spend was believed to be a key factor in Martin O’Neill leaving Villa. Randy Learner will certainly think about money when he makes his appointment. Maybe he should stick with Kevin McDonald and my all-time favourite player Gordon 'Sidney' Cowans. If you consider these six questions you should find a SharePoint Consultant you can work successfully with. If you are located in UK and are looking for a SharePoint Consultant why not contact frank.faulds@office-talk.com to see if Office Talk can help. The future for Aston Villa is very bright if they make the right managerial appointment. If Randy Learner reads this SharePoint blog my advice would be either to see if former Villa idol David Platt fancies being a Premier League Manager. Two games to go now and for Villa fans it really is ‘squeaky bum’ time as we try desperately not to be relegated from the Premier League. Many fans have blamed the manager, others have blamed the owner and I blame the demise of my lucky pants. No, there are lots of reasons for the appalling performances of the great Aston Villa this season and ideally they will start to put these right in the summer. Hopefully ready for another season in the Premier League. 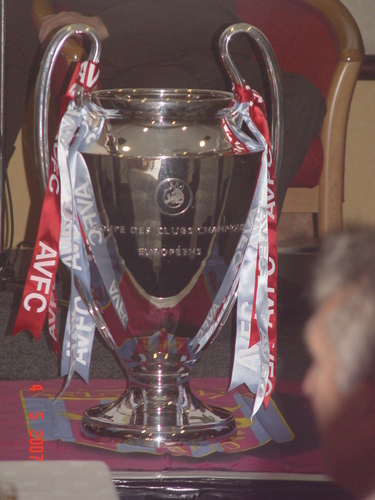 The Premier League without AVFC is unthinkable. It isn’t just football teams that can flop though. SharePoint environments can also hit some pretty rough patches. My blog this week is going to compare how to prevent your SharePoint hitting the rocks with trying to avoid relegation from the Premier League. Many companies invest heavily in SharePoint with key members of the business forming a dream project team. SharePoint is launched with a big fanfare and everything is rosy. A little like a Championship team winning promotion. Reading and Southampton are celebrating now but for their managers the hard work has only just begun. Keeping their teams in the Premiership is the real challenge. With SharePoint the real challenge is getting users to use SharePoint and then keeping them using it. It is not as easy as it sounds. Based on my 32 years of watching Aston Villa, my 7 years of SharePoint Consulting and my 8 years of playing Championship Manager I have drawn a list of six things that are needed to keep SharePoint working and to avoid relegation. I have numbered them 1 to 6 but I think they are probably all of pretty equal importance. But let’s start with Management. SharePoint like a football team needs somebody who is in charge and takes ownership. They need the full backing of the Board but they also need to be accountable. Despite what Microsoft might claim SharePoint won’t look after itself. It isn’t a project that once started you can walk away from. It needs a manager or a management team. There might have been very few successful management teams in football (I can only really think of Clough and Taylor) but in SharePoint Management Teams can work. You might know how SharePoint works and might happily create custom lists and fancy views, but can all the End Users do this. In football even the best players need training and so it is in SharePoint that everyone needs some form of training and most importantly refresher training. It is worth setting up a designated Training Area where users can try new SharePoint tricks out. I have no idea what the Villa players have been doing in their training sessions this season. If you would like any onsite SharePoint training please visit the Office Talk website. If you are using SharePoint you will need to continually invest in it and the money doesn’t stop after Go Live. As with a football club if you don’t invest in it your SharePoint will standstill or end up being relegated to the scrapheap. You need to invest in training, backup solutions, support and SharePoint Add-ons. I would strongly recommend having a SharePoint budget. But then as somebody who works for a company who just does SharePoint I would. If only Randy Learner would invest more money in Aston Villa perhaps the future wouldn’t be so bleak. Maybe this should have been earlier but you need to have a plan. What would you like to do with your SharePoint, how are you going to develop it and will you be upgrading it? You always need to be reviewing and thinking what you can do next with your SharePoint. Football teams need to have a plan of how they are going to play and ideally a plan B when it doesn’t work. Football owners also need to have a plan of what they want from the team. Do they want trophies or a healthy balance sheet? Your SharePoint system needs to be relied on. It needs to be working most of the time and contain the type of information the End User needs. In the same way football teams need players they can rely on. Players who will put in above average performances most weeks instead of players who are brilliant every five games but disappear for all the others. Regular Health Checks can help your SharePoint be reliable. Perhaps some Villa players have been at Villa Park too long and become too comfortable. New signings may have freshened things up and kept things moving forward. In SharePoint freshness is vital and the need for continually updating content is so important. There is nothing more soul destroying than when as a SharePoint Consultant you are involved in an exciting launch, but return a year later to see exactly the same content and the Home site. Wolves were relegated this season with many of the players that had played for them in the Championship three years ago. So those are my six pointers to avoiding SharePoint or Premier League meltdown. I feel that if you get those six right not only will you start to climb the table but your SharePoint will grow and grow. So I need to now start thinking, what I can do as a fan to help the Villa beat Spurs on Sunday and keep them in the Premiership. Maybe my lucky pants need one last outing. After an amazing month of voting the winners of the SharePoint Awards 2012 are now ready to be announced. I can't quite believe the tens of thousands of votes that were cast, but now we have the combined the votes with the verdict of our expert SharePoint panel to determine the eight winners. To find out who the winners and runners-up are click here to visit SharePoint Village. But first let me show you a way to get your users using SharePoint. One of the most frequent conversations at any workplace is of course football. So why not add a bit of football excitement to your SharePoint. Being a Villa fan at the moment means that the only excitement we get is a relegation fight. Unfortunately like the start of April last year I am left working out all the permutations of the Premier League relegation fight. So I have again turned to SharePoint to help me to keep track of what could be a very poor season for the mighty Aston Villa. As Manchester City continue to press the self destruct button and hand the trophy to the other team in Manchester my thoughts are at the other end of the table. Although it is still a good chance to see Ballotelli trying to put his bib on again. With Villa now only five times clear of the relegation zone (and without Darren Bent, Richard Dune and sadly captain Stiliyan Petrov) it means that Villa along with 5 other Premiership clubs are left fighting for survival. This really is 'squeaky bum' time. Last year, one Sunday, after realising the Villa could be relegated I tried to work out the best way to record the relegation battle. At first I tried a complex spreadsheet listing all the fixtures each of the twelve struggling teams had to play but this was far too restrictive. Then it struck me that SharePoint was the ideal tool to produce numerous reports and lists based on the information I had available. So by importing my spreadsheet (it took only seconds as the 'Create List' contains an 'Import Spreadsheet') and creating lots of different views I soon had a Site created that I will be using for the remainder of the season. Now I have had to do it all again. Hopefully there will be a happy ending with the Villa remaining were they belong in the Premiership. It might go to the very last day though but it is sure to be exciting. As I am quite pleased with the SharePoint Site I have created called 'Relegation Fight' I would like to open it up to the many other slightly worried football fans (it is designed for all the bottom 7 teams;Wolves, QPR, Bolton, Wigan, Blackburn, Villa and Albion). But while the famous Aston Villa try to stop their losing run 9 SharePoint companies are today celebrating being winners at the SharePoint Awards 2012. Congratulations to everyone who has won a Gold Seal in this year's awards. On the 'Relegation Fight' SharePoint Site I have predicted all the remaining games for each of the twelve teams. If my predictions were to come true then Wolves, Wigan and Blackburn will be appearing in the npower Championship next season. But football is rarely predictable and as Jimmy Greaves was fond of saying 'it's a funny old game'. Whatever your team try to follow the words of Corporal Jones in Dad's Army and 'DON'T PANIC!'. To close this week though I have to send my best wishes to one of my current favourite Aston Villa players Stiliyan Petrov who was diagnosed with acute leukaemia on Friday. Get well 'Stan' we all know you can beat it and want to see you back in the Villa midfield in the not too distant future. Whatever SharePoint project you are involved in you are bound to hear the term ‘SharePoint Governance’, but what exactly is it and who needs it? Basically ‘SharePoint Governance’ is the rules and responsibilities that you put in place to ensure that SharePoint works as your business/organisation wants it to work. For example your company Document Management Policy might state that all documents must have a Document Owner and be reviewed every two years. So your SharePoint needs to somehow enforce that all documents have a Document Owner and are reviewed every two years. This is just one of the many examples of SharePoint Governance. The problem with ‘SharePoint Governance’ is that these rules and responsibilities can be anything your business/organisation wants them to be. I say a ‘problem’ because you can’t just Google it (or Bing it) and find the exact set of SharePoint Governance that fits your needs. You need to spend time thinking about all the different parts you need to implement. This part is made a lot easier if your business/organisation already have policies and procedures in place. It is fairly straightforward to enforce existing policies using SharePoint the time taken is in reaching agreement on the policies to start with. I am not really explaining this well so I am going to resort to doing what I often do and explain it in football terms (for my American readers this is the kind of football where only goalkeepers get to use their hands). Imagine a game of football if nobody had ever clearly defined the rules. Well, this is like SharePoint without any governance. Probably great fun but soon it would be totally out of control. Without rules you aren’t controlling how many players are there on each side, how big the pitch is, how long the game will last and what exactly is a foul. It would be like those games in the street that end up forty a side and never seem to end (sounds like American Football!). So you need to have rules. You need to put limits in place as you do with SharePoint. But what good are rules in both football and SharePoint if nobody is responsible for enforcing them? In football we need a referee (we seem to be gaining more all the time at the moment) to make sure that the players do keep within these rules. In SharePoint Governance it is important to define responsibilities. What is expected of a Site Owner or who is responsible for a certain Site Collection? So if it helps to understand what ‘SharePoint Governance’ is remember it is rules and responsibilities and think of football rules and refs. I started by saying “..what exactly is it and who needs it?” well, I have mentioned what it is, but who does need it? The truth is that all SharePoint environments needs some level SharePoint Governance but how much really depends on two factors. Firstly, how many users you have. Secondly, how important your information is. Truth is if you have less than 5 users you don’t need that many rules and responsibility is not so important, but if you have 100,000 users and critical business information then the rules and responsibilities are vital. So I am saying the amount of SharePoint Governance you require is proportionally linked to number of users and importance. Let me take you back to my football comparison. If four of you are playing football in the park then you might need some basic rules (i.e. the jumpers for goalposts each end are nearly the same distance apart) but you don’t usually need a ref. However, if you are playing in the Champions League Final with billions watching and millions of pounds at stake then you need every rule clearly defined and multiple people responsible for ensuring all these rules are enforced. Not only rules of the game but rules of advertising, rules of television rights and many other rules have to be sorted. So this is like a multinational SharePoint environment with the highest value information. If this is the case a very considerable amount of time needs to be devoted to ‘SharePoint Governance’. It is important not to get too bogged down with ‘SharePoint Governance’ when you are starting your SharePoint project though. It can develop and change as your system develops and changes. When William McGregor, the famous son of Aston Villa, founded the English football league in March 1888 he did not think about crossbars, floodlights, shirt sponsors or Mobile Telephone Broadcasting rights; these things all came slowly during the next 124 years. Maybe William should have included a rule that a team in claret and blue from Birmingham must always be in the top division. Hope this blog answered the questions of what ‘SharePoint Governance’ is and who needs it. If you wanted any help on deciding on how to define rules and responsibilities for your SharePoint then please don’t hesitate to contact Office Talk. Just two notices to end with this week. Firstly, voting in the Andy Dale SharePoint Awards 2012 has been phenomenal but closes on 1st April 2012. If you haven’t voted yet in any of the eight SharePoint sections please vote now at http://sharepointvillage.com/?page_id=7456 . One of the important things to remember in any SharePoint implementation is to make it as easy as possible for the user to navigate. I am sure, like me, when you drive one of the most annoying things is lack of signposts. When you are unsure which way to go and come to a T junction you expect a signpost showing you where each road will lead you. I am still very wary of Sat Navs because I always think what if the Sat Nav is lost itself or suddenly goes out of range. So I like a good old fashioned signpost. The same is also true for me within SharePoint where despite the modern way being to use the ‘Search’ I still favour simple navigation. The Search in SharePoint is good and has advanced a lot since the early versions of SharePoint, but still it is prone to finding excessive amounts of results and relies on the author having used the correct terms in the document. So I want to share with you a few basic rules I use when creating navigation within SharePoint. These aren’t defined ‘Best Practice’ just a few rules that have helped me over the years. Now, before I list the rules let me just clarify the terms used for navigation in SharePoint. If you are using Windows SharePoint Services, SharePoint Foundation or a Team Site on SharePoint Server navigation comes in two parts. These parts are called ‘Top Link Bar’ and ‘Quick Launch Bar’. They can be accessed by Site Actions – Site Settings. Very simply ‘Top Link’ is along the top and ‘Quick Launch’ along the left-hand side. It is though possible using SharePoint Designer or different Page Layouts to change the position of these around. You might be the kind of person who likes their ‘Quick Launch Bar’ on the right of the page. We are all different. 1. Never have an item listed in both the ‘Top Link’ and ‘Quick Launch’ navigation. 2. Try to have a consistent ‘Top Link’ throughout your sites. Inheriting from Parent site wherever possible. 3. Never have more than eleven items in the Top Link Bar. If you have to scroll right you have too many. 4. Try and make the names of the items on the Top Link Bar a similar size (probably no more than 20 characters including blanks) and consistent with terms used in your organisation (for example use common names for departments of products). 5. In Quick Launch bar use meaningful headers. Change the standard headers like ‘Libraries’ and ‘Lists’. Headers need a URL though so a cheat I often do is to add the URL of the Home page of the site so clicking on it doesn’t take you anywhere. 6. Order the Headers in the Quick Launch Bar so the section that will be used the most is at the top. Try to keep these headers and the order of them consistent on other sites. 7. Move the links in the Quick Launch to under the appropriate Header. 8. Add links to the Quick Launch that go to different Views and also links that open New Forms. To find the URL for a new form just open a form, right-click and copy the URL until the end of the NewForm.aspx. 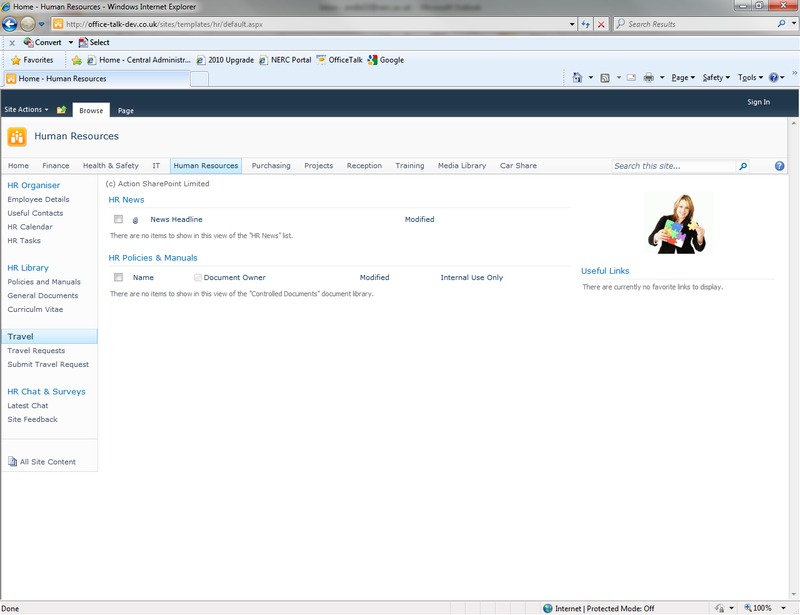 In SharePont 2010 copy url for 'All Items' view and then replace the part all%20items.asox with Newform.aspx. 9. Keep the labels for the links on the Quick Launch meaningful but short. They should not wrap over more than two lines. 10. If you have to scroll down the page to see all the Quick Launch items then there are too many. The SharePoint Awards 2012 are certainly going well with staggeringly over 5000 votes cast in the first week. If you haven’t yet cast your votes please read the list of finalists in the post below. I shall end this week’s post with something I have never done before. I am going to congratulate Villa Manager Alex McLeish on helping Villa win against Fulham last Saturday and going along way to keeping us in the Premier League. His substitution might have been greeted with cries of ‘You don’t know what you are doing’ but when substitute (and future star) Anders Weimann scored the winner with the last kick it had Villa Park rocking. Maybe , just maybe there might be a future at Villa Park for Mr McLeish. 1. Best SharePoint Information Store? 2. Best SharePoint 3rd Party Application? 3. Best SharePoint Training Provider? So after three categories it is time to take a short break so time for an advert. We have to thank SharePoint Village, the One-Stop Shop for all your SharePoint needs for yet again hosting my awards. Whilst you are thinking about who to vote for why not take time to browse the many different SharePoint shops. See what SharePoint bargains you can pick up. 4. Best SharePoint Web Part? 5. Best Web Part Provider? So as you take a look at the different Web Parts available for all versions of SharePoint I am reminded by those nice people at SharePoint Village to say that they have a section of Shops devoted just to companies supplying SharePoint Web Parts. So why not take a virtual stroll there? Coming up we have the 'Best SharePoint Management Tool where two previous winners go head to head, but first let's add a bit of humour with a talking dog. 6. Best SharePoint Management Tool? 7. Best Free SharePoint Product? The last category is a new one and a special thank you to the many great SharePoint people out there who write SharePoint Blogs. They might not use videos of talking dogs but there blogs contain great technical SharePoint information. Okay now you have seen all the finalists it is time to open the voting at SharePoint Village. You have until April 1st 2012 to get your votes in. You can vote for up to two finalists in each category. Good luck to all the finalists and thanks to all of you for helping to make SharePoint an even better product. So get voting!!! May the best SharePoint products win. Now for a bit of extra time fun and my own five finalists in a competition the Villa might just win. Who has been the most unpopular Premier League Manager in 2012? Please feel free to leave your comments on any of the SharePoint products or the unfortunate managers.